With a slight delay, a new version of the armed actors mapping has now been launched and can be found here & here respectively. 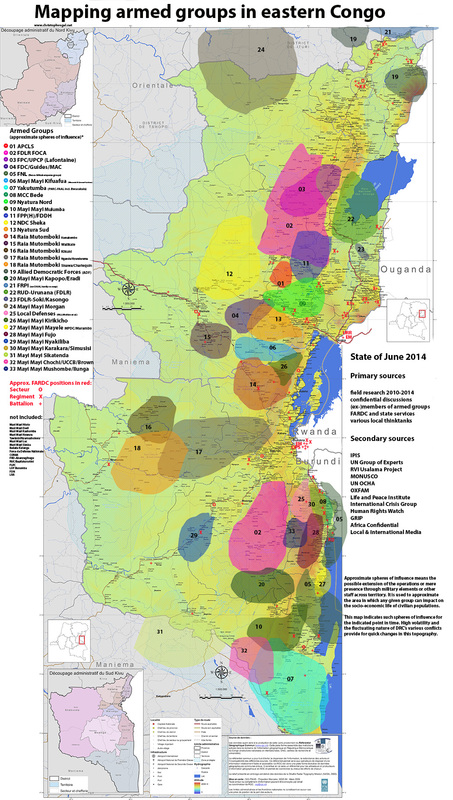 At a first glance, it does not entail major changes, but a closer look shows how recent military operations (especially those involving MONUSCO’s Force Intervention Brigade) have impacted on the region’s conflict landscape. As with previous versions, also this map is far from being 100% accurate. It represents one more snapshot of the current situation (again with a one-month delay due to cross-checks and verifications) and slight errors are necessarily included. Moreover, it can not be repeated often enough that this whole mapping exercise is based on a methodology to trace spheres of influence rather than exact positions. Only in the case of the meanwhile included FARDC positions, more exact but not necessarily 100% accurate positions are provided. A similar exercise will be done for MONUSCO positions in the next edition of the mapping.